President Nominated Four new Rajya Sabha Members - IAS - Daily Current Affairs, IAS Syllabus Exam Strategy, IAS Preparation. 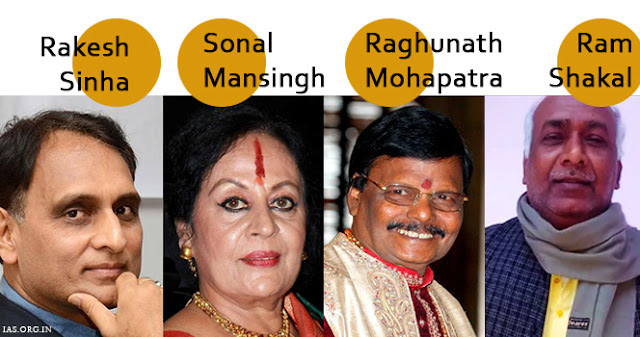 President has nominated four new members to Rajya Sabha. Article 80 of the Constitution gives the President right to nominate twelve members in Rajya Sabha from people who have special knowledge or practical experience in art, literature, science and social service. The rationale behind this principle is to provide eminent persons a place in Rajya Sabha without going through the process of election. Sonal Mansingh is a well-known Indian classical dancer and Guru Bharatanatyam and Odissi dancing style. She is a recipient of Padma Vibhushan (2003), Kalidas Samman, Sangeet Natak Academy Award among others. She is a highly respected choreographer, teacher, orator and social activist. Internationally acclaimed sculptor, Mr. Mohapatra is an authority in stone carving because of his deep knowledge of the traditional style of sculpting in temple architecture. His long line of works includes beautification of Jagannath Temple, the Sun God statue in Parliament Hall, decorative central circle and pillars in Park Street Kolkata, Mukteswar gate in red sandstone at Surajkund Haryana, Wooden Buddha in Buddha Temple, Paris. He is also a recipient of Padhma Vibhushan (2013). He teacher of more than 2000 sculptors. Mr. Sinha is RSS ideologue, a respected and widely read author, Shri Rakesh Sinha is the Founder and Honorary Director of the Delhi-based think-tank “India Policy Foundation.” A professor of Motilal Nehru College of Delhi University, he is also currently a member of the Indian Council of Social Science Research. Ram Shakal is a Dalit leader from UP. He is widely respected for championing the cause of farmers, laborers and migrants. He has also been a three-time Member of Lok Sabha.